Prosecutors are seeking prison terms of 30 months for Wiedeking (left) and 27 months for Haerter (right). 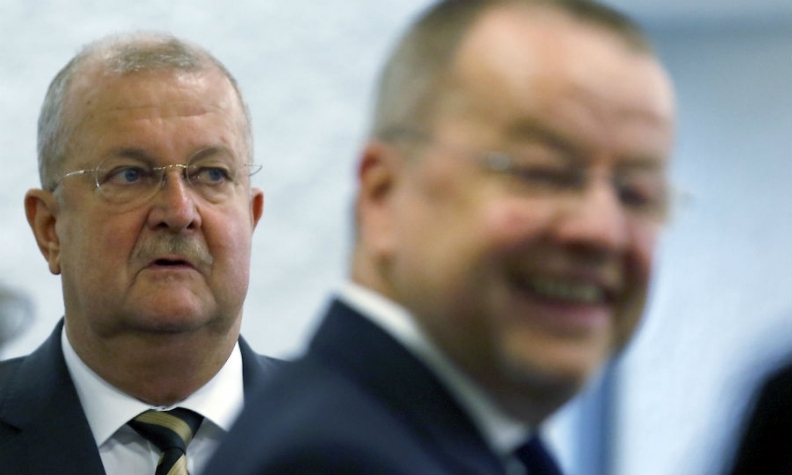 BERLIN (Bloomberg) -- Lawyers for former Porsche CEO Wendelin Wiedeking and ex-Chief Financial Officer Holger Haerter have asked for their clients to be acquitted at the end of a criminal trial that has seen the two men face accusations of having manipulated Volkswagen shares during a failed takeover of VW in 2008. The lawyers said prosecutors "invented" a story to back up charges that the men misled the markets before the failed bid to take over Volkswagen. The lawyers roundly criticized prosecutors as they called for the acquittals during closing arguments at the nearly five-month-old criminal trial in Stuttgart, Germany, on Monday. None of the witnesses backed up claims that the men had secretly plotted the acquisition long before they announced it on Oct. 26, 2008, according to Wiedeking's lawyer, Walther Graf. "This trial showed: The story told by these charges is freely invented," Graf said. Prosecutors' theories "obviously originate out of pressure to win a conviction under any circumstances." The two men are on trial for allegedly lying about their strategy on VW and the purpose of options they had secretly built up. When Porsche on Oct. 26, 2008, first disclosed its acquisition plan and its option holdings, short sellers drove up the price of VW shares as they scrambled to cover their positions. Porsche later gave up its scheme after funding dried up amid the financial crisis. Prosecutors are seeking prison terms of 30 months for Wiedeking and 27 months for Haerter and fines of 1 million euros ($1.1 million). The company should also pay a fine of 807 million euros, prosecutors said in their own closing arguments. A verdict is scheduled for Friday.